You are here: Home / Natural Infertility Treatments / FeMale Infertility Natural Treatments / How to Solve Infertility Problems in Women? The use of drugs in infertility treatments work better in women, according to researches. Infertility drugs used for infertility in women are usually used to regulate ovulation and these drugs are effective in dealing with ovulation disorders caused by hormonal imbalances. These drugs can also be used in stimulating some hormones that are needed for increasing ovulation in such women. ∙ Aromatose inhibitors are usually recommended for individual women who have not responded to some other forms of infertility treatment drugs. This medication combines two powerful hormone regulating drugs – anastrozole and letrozole. 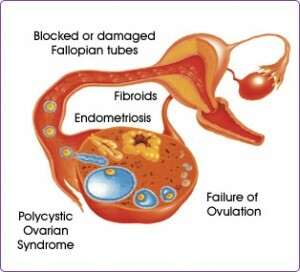 The medication is not normally applied on a woman unless other drugs have failed to yield any positive result because it may cause serious side effect on such women – child defects and miscarriages are common side effects of this medication. ∙ Clomiphene is one of the most popular drugs for infertility treatments in women, it is particularly recommended for women whose infertility problems are caused by the polycystic ovary syndrome and some other kinds of Ovulation disorders. It works by stimulating the release of follicle stimulation hormone in the pituitary glands, alongside the Luteinizing hormone which play prominent role in stimulating egg development in the ovarian follicle. ∙ Repronex is another potent drug for the treatment of infertility in women. It is also referred to as the Human menopausal gonadotropin, and it is a kind of injection which is given to women who are no longer ovulating. Repronex is ideal because it stimulate the ovaries in general rather than focusing on only the ovary stimulating hormones. Repronex is one of the best infertility cures for women who are witnessing a rapid decrease in their ovulation rate as a result of age as well as several sicknesses which has depreciated their reproductive health. All the drugs used for infertility treatments in women should be closely monitored in order to avoid side effects.